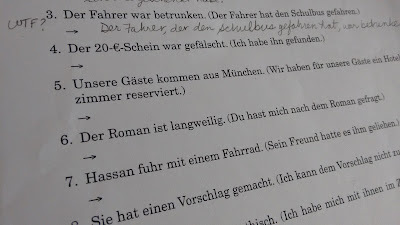 Most of the time, learning German is just time-consuming, but an okay brain workout. However, sometimes the learning materials can be a bit alarming. Take this worksheet, for example. "Der Fahrer war betrunken. Der Fahrer hat den Schulbus gefahren." In other words, the driver was drunk and drove a schoolbus. Is that not disconcerting? Why must such a creepy example be used? Are there seriously no other sentences that would fit? It was a rather general exercise where we rewrote the sentences, combining them and using relative pronouns. In another class, we were given cards with a picture and we had to "interview" other classmates about the topic. I had the card for cigarette sellers and my card depicted a pen. My classmate had pedestrian crossing lights and her card had two arms on it. We were incredibly confused. Duolingo adds to the creepiness factor with sample sentences like: "Women love babies." "I like women." "The man runs with the women." "The man and the woman have many children." "Do you have a girlfriend?" "The men follow the women." There are stalker German sentences now? What next! Things got even weirder. "What is your gender?" Um, what? 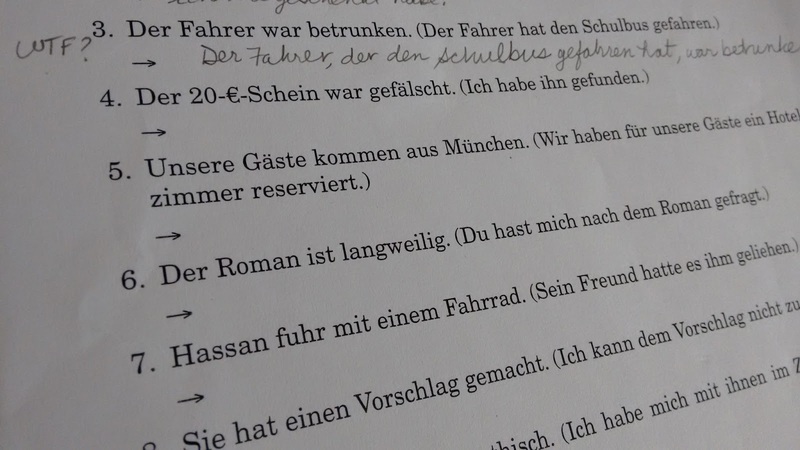 I'm not looking to learn 'I want to hit on people/start a family/stalk people' style German. At least it didn't have any haughty British people speaking down to German waiters or any stuck up Americans saying how expensive their houses were, as some of my other books used as a basis for conversation. Too bad it wasn't something useful though!